The iPad has been a roaring success so unsurprisingly every manufacturer out there has looked to match Apple's tablet in terms of style, functionality and most importantly popularity. 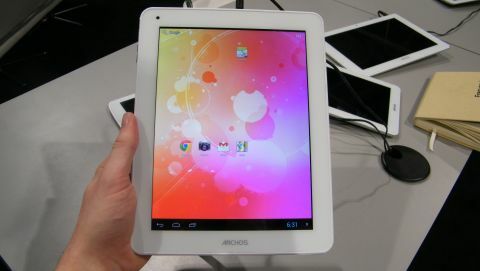 The next young pretender to the iPad's crown comes in the form of the Archos 97 Titanium and after all the legal shenanigans with Samsung we're surprised this tablet bares so much of a resemblance to Apple's slate. Picking up the 97 Titanium we noticed it had quite a weight about it which made one-handed use a strain on the wrist, so you'll need to use both mitts or rest the tablet on your lap for extended periods of usage. As the name suggests there's a 9.7-inch display present with boasts a Retina-like 2048x1536 Super HD IPS resolution, providing a bright and crisp image. This meant that Android Jelly Bean looked impressive on the 97 Titanium's screen, and Archos has not meddled with Google's platform giving you full access to the highly flexible operating system. With a 1.6GHz dual-core processor and quad-core GPU the Archos 97 Titanium is modestly powered, although Jelly Bean wasn't the slickest operation we'd experienced. This is something we hope gets fixed before it goes on sale next month, as it would be highly frustrating for any user if it doesn't. Of course video playback on the 9.7-inch Super HD IPS display is impressive with vibrant colours and a high level of detail, and the dual speakers round the back of the 97 Titanium produce a decent audio volume although it's not the crispest sound. This is the only price band for the Archos 97 Titanium as it's only available in its 8GB, Wi-Fi only guise – a big disappointment for anyone who likes a large amount of storage in their tablet or the ability to access the web on the move. An ace up the 97 Titanium's sleeve though is the inclusion a microSD port allowing you to build on the pitful storage inside – something a lot of 10-inch tablets don't support these days. As you'd expect from a 2MP camera image quality isn't great but the Archos 97 Titanium isn't a device made for taking pictures, it just has cameras to tick another box on the spec sheet. Sure it's got the various bells and whistles of most tablets these days but it lacked the polish of Apple's creations and other Android tablets are faster, smoother and feel nicer in the hand. The price point is certainly competitive and you get a decent chunk of tablet for your money, but if you're looking for something which is going to rival the iPad then you've come to the wrong place.